You’ve got the space. You’ve got the friends. Now all that’s left for that perfect summer block buster is the backyard entertainment area! But with so many great design ideas floating around social media and HGTV, it’s daunting to design the yard of your dreams! At The Backyard Showcase, we’ve cut through the noise to bring you a collection of backyard ideas — that won’t break your budget, or your back! Stay tuned to get inspired by our top entertaining area ideas that are hotter than the blazing summer temperatures! We hope you’re ready for some serious outdoor parties this season, because with a space filled with ideas like these, friends and family will want to be at your house ALL the time! Here are our 7 favorite ideas to turn your backyard from an unused eyesore to a magazine-worthy oasis! 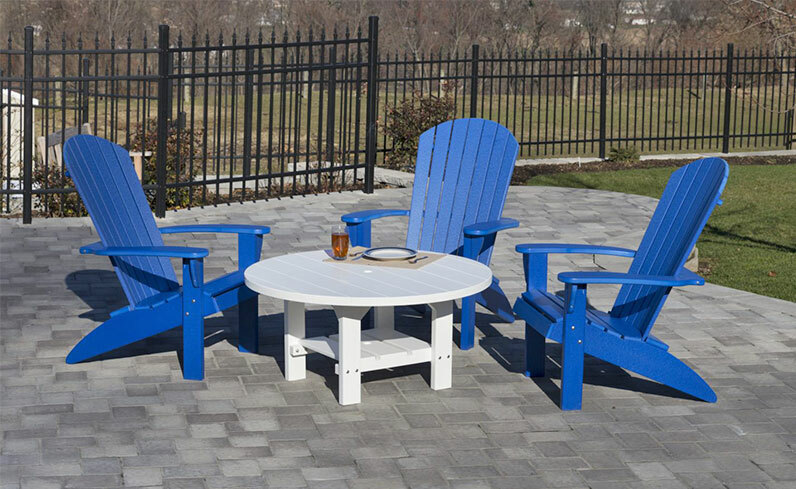 One of the first things people will notice about your outdoor entertainment area is the furniture. With the ability to turn an ordinary space into a resort-level paradise, finding the right outdoor furniture is a MUST. Of course, outdoor sofas, chairs, and tables are a good place to start. But for a space that will turn heads, you won’t want to stop there! At The Backyard Showcase, we stock TONS of unique lounge chairs, modern floating canopies, and organic tabletops. Summer blockbuster meets classic summer experience. An outdoor movie set-up is fun for all ages AND can be an easy DIY creation or online purchase. It’s the one thing every backyard entertaining space should have, but few actually possess. Whether you install an outdoor TV or a weather-proof theatre screen, the options are as endless as the fun you’ll have. 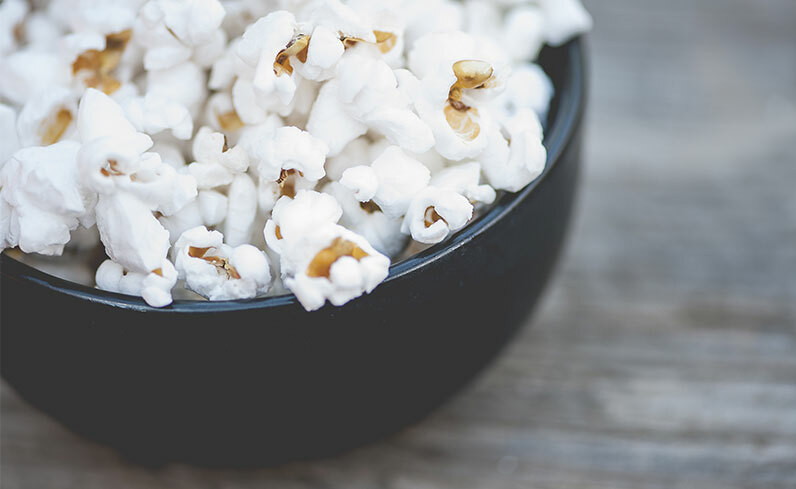 Grab some big blankets and a few snacks — you’ve got a full evening of entertainment! And hey, it may just help the kids spend a little bit more time outdoors this summer. 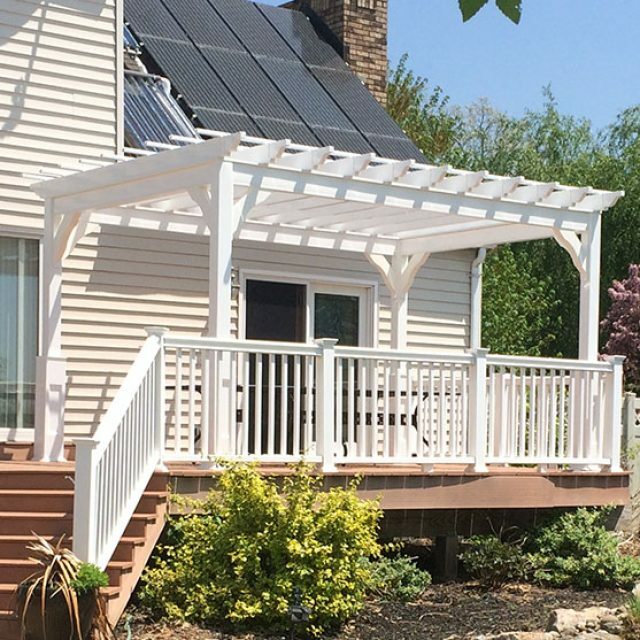 The most beautiful way to make your backyard accessible in all sorts of summer weather — like rain or excessive heat — is with a pavilion. 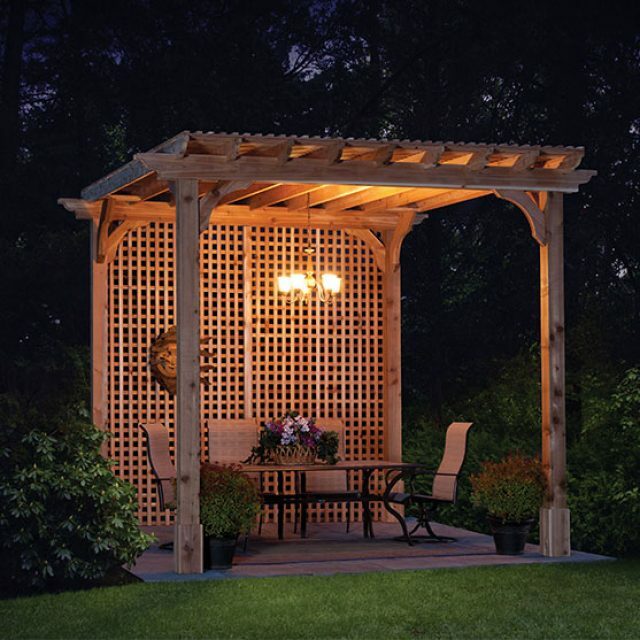 A pavilion can be an extension of the home, or free standing over a stunning outdoor seating area or a firepit. 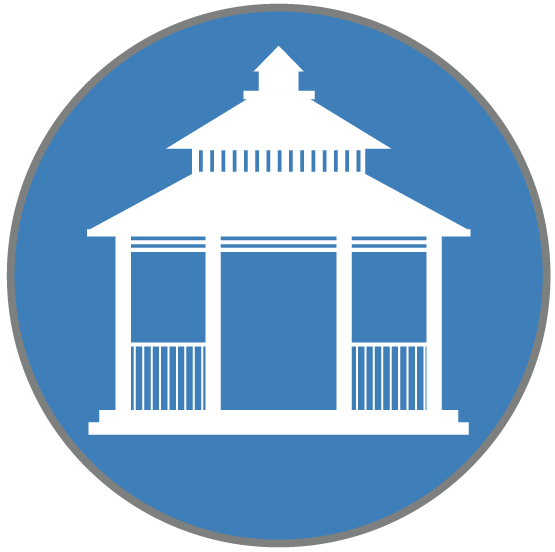 Beyond that practicality, a pavilion brings that extra stylistic pizzazz! At The Backyard Showcase, Amish built pavilions are our signature item — we have dozens of vinyl, wood and cedar options to choose from. Some of the best memories over summer are made after the sun goes down — the setting sun should be an invitation for your outdoor entertainment area to become even more beautiful! Light up the night with affordable, artistic, and functional hanging bulbs. Easily drape a string of lights along a pergola, suspend them from the roof, or wrap them around trees for a look that’s glamorous and laid back. 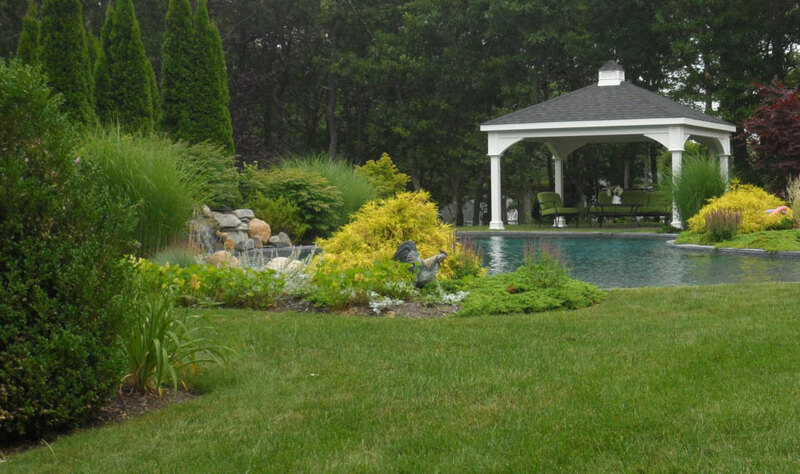 What complements that beautiful in-ground pool you just built? An even greater pool house, of course! 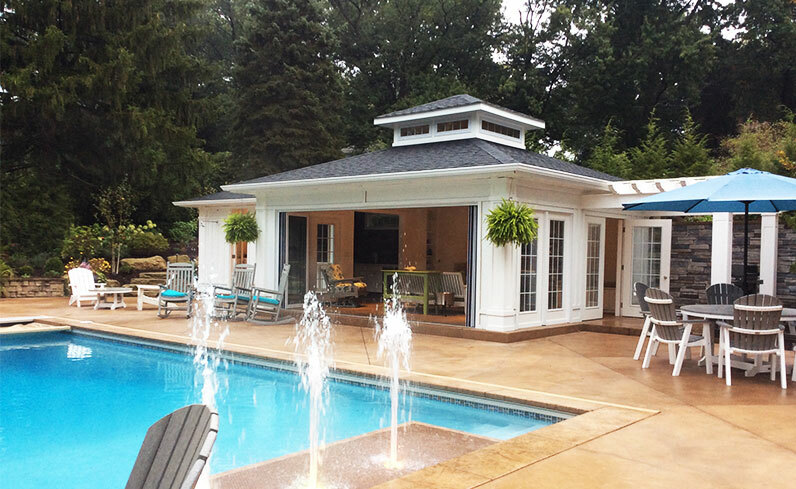 While there are lots of design, material, and style choices of a house or a cabana, some of our favorites include white vinyl freestanding cabanas or a natural wood enclosed pool house. 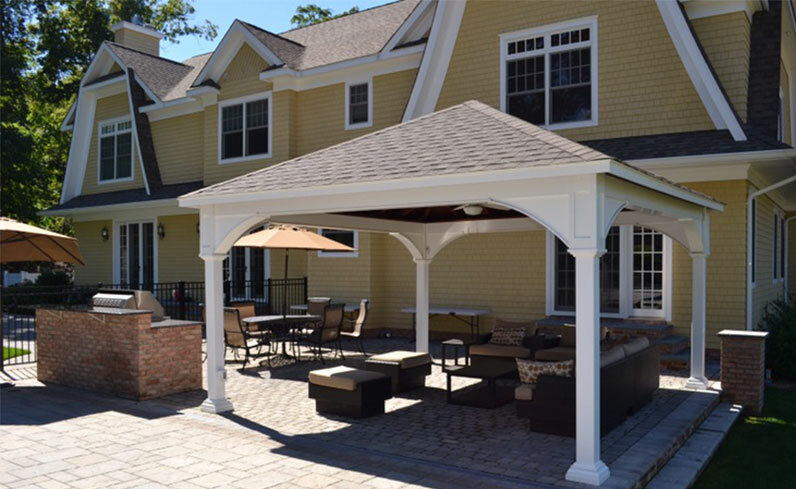 A phenomenal investment, pool houses are a creative way to add additional storage and space to any outdoor entertainment area. Forget chopping down trees and slicing up firewood — those days are over! One of our favorite time-saving outdoor entertainment area ideas is indeed a fireplace, but not one that you may have ever seen before. An electric fireplace is easy to start and easy to put out, which lets you spend ALL your outdoor time relaxing. 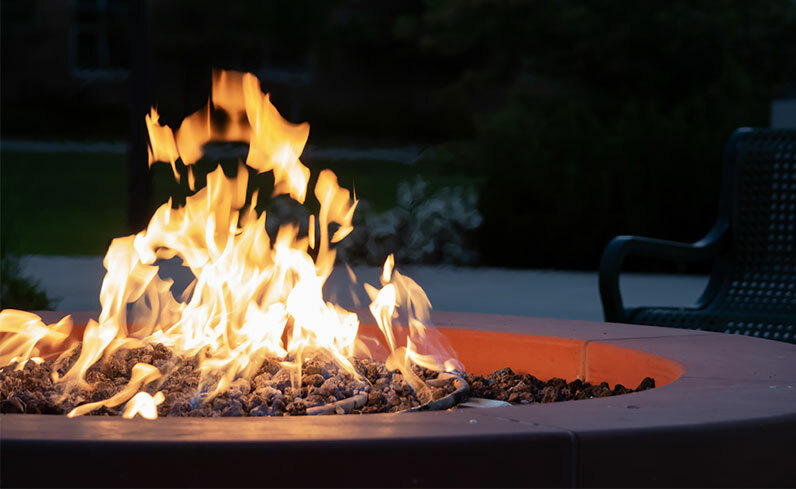 However, for some homeowners, their backyard entertaining space isn’t complete without a real fire and roasting marshmallows — and traditional options are still available! Backyard entertaining spaces don’t have to be large in order to be lavish. The right styling can make it feel big anyways. So if you happen to be a little tight on space, but are still looking to have that HGTV yard that makes your neighbors jealous, we have just two words for you: hot tub. 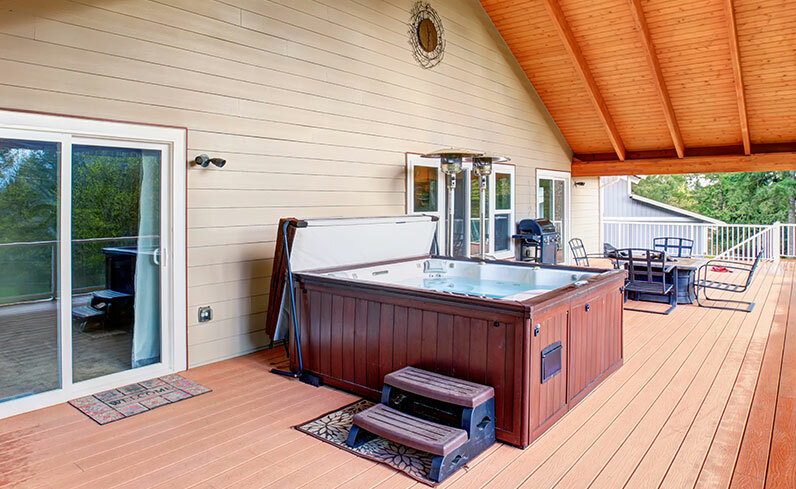 Whether it’s built into the pool, sunken in the deck, or freestanding with a stellar view, hot tubs are an American favorite — and it’s easy to see why! 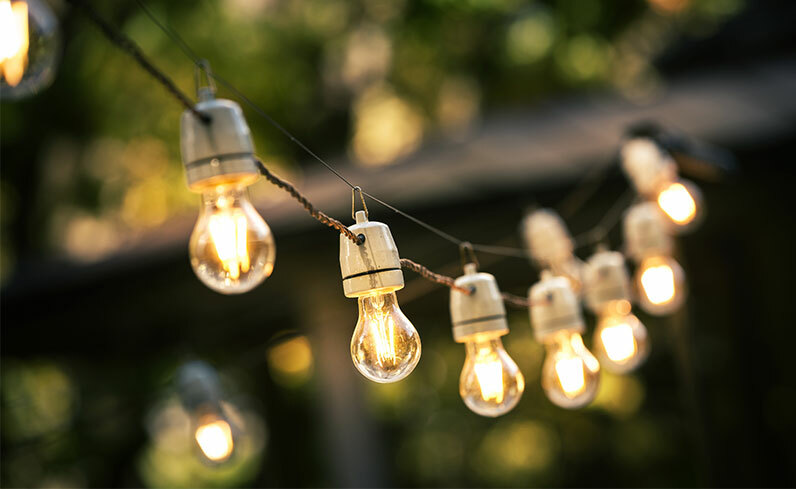 Now that you’re overwhelmed with creative outdoor entertainment ideas, it’s time to pick the ones that peak your interest the most. Our team of outdoor experts at The Backyard Showcase are eager to help you design and achieve your own personal backyard getaway. 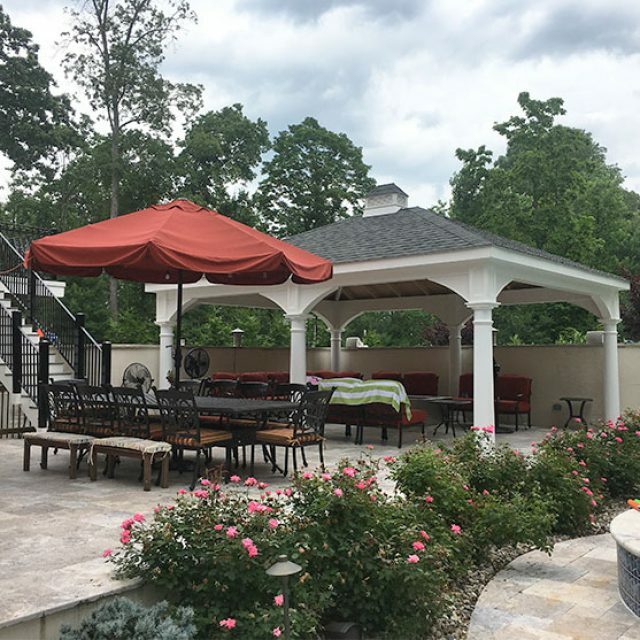 The first step to getting the outdoor entertainment area of your wildest dreams is to start the conversation about any of our outdoor furniture pieces, pavilions, or cabanas! Visit our conveniently located showroom, give us a call, or simply drop us a line!